Little notes from Heather and Martin: Christ is Risen! 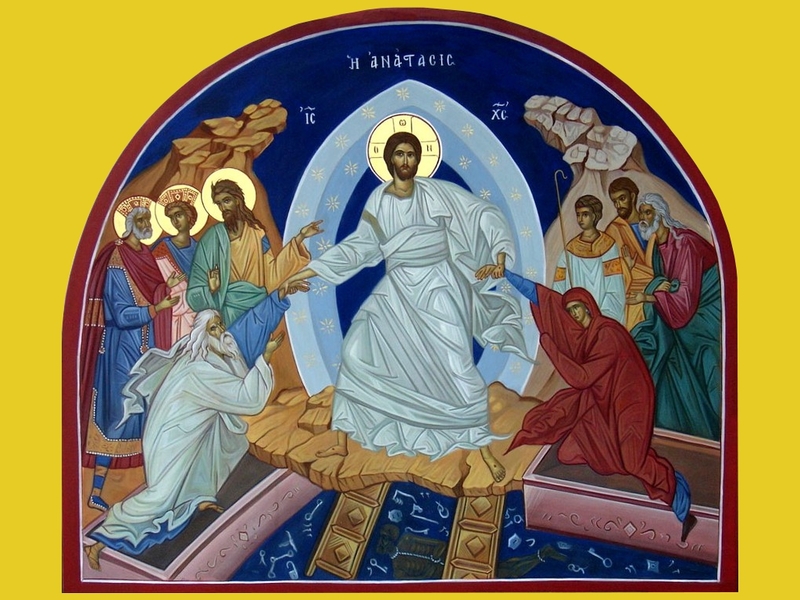 This is the traditional icon used by the Orthodox church to commemorate Jesus rising from the dead - it's known as the 'Anastasis' or the 'Harrowing of Hell'. This one is Greek. Icons are symbolic pictures where every element has meaning (although those meanings are sometimes a little disputed) and the artist has relatively little 'artistic license'. In this one, we see Jesus is in the centre, rising from the grave on two planks that represent his cross. Beneath him you can see Satan (pictured with two heads to symbolise that he is the Father of Lies), who Jesus has bound with a chain. Around him are many broken locks and keys, symbolising that Jesus has broken Satan's captives out of prison. First amongst these are Adam and Eve, the two figures he is physically hauling out. On Jesus' right are various Biblical heroes: many say these are Moses, David and Solomon, although some identify one of them as John the Baptist. On his left some say we see Cain (the first righteous martyr), alongside unidentified people, although others say these are the three young men from the fiery furnace. The mountains on either side represent the ground having been ripped open to let Jesus out of Hades. The blue arch thing represents his glory. The Greek lettering at the top says 'Anastasis' (the Greek name of the painting) and on either side of the blue thing are the initials for 'Jesus Christ'. The letters in the halo say 'he who is' - referring to God describing himself as 'I am who I am'. I no longer remember where I sourced this image from and I don't know where the original is, but I have used it as the desktop image on my laptop on Easter day for some years - it helps me remember Jesus' victory.